It is not often that you come across philanthropists as active as Connie and Gail Siegel. Their support of the Jewish community spans multiple sectors, centuries, and countries. Connie, an actuary, and Gail, who was in child development, met at the University of Wisconsin and spent the early years of their marriage in Toronto, Canada. 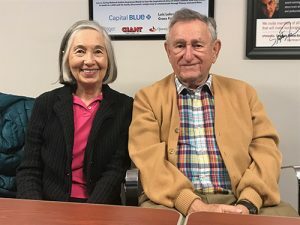 After moving to Harrisburg in 1959, Gail and her friend, Barbara Adler, started a nonprofit program for child abuse prevention and parental education called the Children’s Playroom. Connie soon started his actuarial firm. Together, they began their family. “We’ve always been good friends with Lois,” says Connie. “When she says ‘I’m taking an interest’, we usually go along.” Lois was instrumental in getting Connie involved as a board member, and later chairman, of the Greater Harrisburg Foundation, whose assets are now valued at more than $100 million. “Gail and I give to organizations that do good,” says Connie. The Siegels, along with the Spectors, were instrumental in drafting a letter that was sent to community members, asking each recipient for a $5000 gift to help to continue the program. “Besides asking people for money, we’re informing them about the program,” Gail continues. “If someone you know and respect sends you a letter, you say, ‘If they’re supporting that, it must be something that’s really needed in our community.’” Three months later, JFS has received enough commitments to keep the program going for the foreseeable future. Please join the Siegel’s in leaving a legacy gift to JFS through your will, trust, retirement account or life insurance policy. Thank you to the Jewish Community Foundation for coordinating this important initiative on behalf of our community.